Q1: I’ve heard it’s more expensive to have a vegan diet, is this true? I’ve actually found that it can be cheaper to live a vegan lifestyle! During my first semester of college, I didn’t follow a vegan diet and over the course of the semester I definitely bought a fair share of snacks and takeout from restaurants. When I started my vegan diet, I had much more limited options in terms of what I could buy conveniently. I didn’t order takeout nearly as much, and when I did purchase food it was well thought-out and budgeted for. In-season produce can be really cheap, and tofu is usually less than $3 per package, which is great! When I ate a completely vegan diet over the summer while working a very intensive outdoor job, my average grocery bill was about $30 to $40 per week. The secret is buying bulk oats, produce, and other staple items! There are lots of resources on Pinterest for finding grocery lists and bulk essentials, and I have written a number of posts on the vegan section of my blog as well! Q2: What does a healthy vegan diet include? Lots of raw foods and minimally processed snacks! Many people tend to think that being vegan is a big limiting factor when it comes to what you can eat, but the options are truly endless. There are so many substitutes for common non-vegan items that are sometimes even cheaper and more readily available than their alternatives! Some of my favorite non-dairy milks include almond milk, cashew milk (especially cashew milk ice cream! ), and coconut milk. Tofu, polenta, and veggie burgers make for great meat alternatives and can be incorporated into many different recipes! Many people worry about not getting enough protein, but raw foods and plant-based products have a great balance of protein, vitamins, and minerals. Q3: What if my college dining hall doesn’t offer vegan options? I have definitely been in this situation, and it isn’t easy. But I’ve found that I’ve been able to adapt and feel much better because of it. My college dining hall does have a vegan station, but it is quite sparse and a bit lacking in nutrients and variety. I only go for dinner, and I make a weekly trip to the grocery store to stock up on breakfast and lunch essentials. For breakfast I love to make rice cakes with nut butters (peanut and almond are my favorite), and there are great cereal options with non-dairy milks. Oftentimes non-dairy milks are cheaper than dairy milk, and Kashi brand cereals frequently have coupons. I work on campus during the popular lunch hour, so I have gotten in the habit of packing my lunches. This can be easy and affordable as well, with salads, vegan ramen, and sandwiches as options. I’ve found that there are often sales for easy lunch sides such as chopped vegetables, applesauce, and fruits. Even though it can be slightly more challenging than lunch at the dining hall, I have noticed amazing health and budget benefits. It also lets me get off campus when I make trips to the grocery store! Q4: Is there an easier way to get essentials other than frequent stops to the grocery store? Thrive Market has been a lifesaver for me as a busy college student, especially around midterms and finals! It’s an online organic grocery store with all of the dietary options that you might need. They have gluten-free, paleo, vegetarian, vegan options, and many more. They are extremely affordable and often have great promotions! I usually have a vegan protein powder for smoothies on hand (one of my essentials), and they always have it in stock and often on sale. There are also other subscription services (Vegan Cuts, UrthBox) but I haven’t had as much success with these. I hope these tips help you in your journey to becoming more plant-based in college! If you have any more questions, don’t hesitate to send an email to thewisewillowblog(at)gmail.com or to send me messages on any of my social media accounts! Alyssa is a second-year college student with a passion for plant-based living, minimalism, and intentionality. 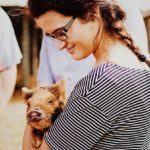 She is an animal lover, an adventurer, and a lifestyle blogger at www.thewisewillow.com.